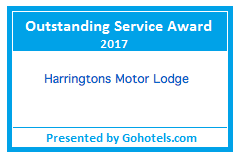 Harringtons Motor Lodge understands our business practices have a direct impact on the environment in which we operate. Consequently we take our responsibility to our environment and community as a fundamental part of our business. We recognise the importance of taking steps to achieve sound environmental performance in a considerate and efficient manner without compromising our services, or our guests comfort. 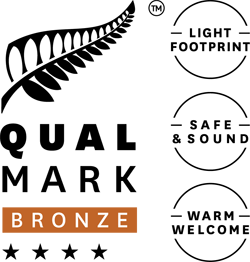 We are proud of our Enviro Silver and Qualmark 4-Star certification. Informed buying decisions, buying locally, efficient use of water, energy, cleaning and office products, fuel and other resources, recycling as much waste as is practicable and donating goods to local charities ensures our business reduces our environmental impact. We are continually monitoring our electricity and gas usage to ensure we are operating as efficiently as possible. Through monitoring we can keep track of our energy and resource usage, and check the effects of any new initiatives we implement. Where possible and safety permits we have lights on timers and we will only operate the large gas dryer when we have a full load. By monitoring our water usage each month it makes us very aware of this precious resource. An example of our water conservation is when practical we will only wash a full load of laundry. Heated bath rails are provided in all units and we invite guests to use towels more than once. Our aim is to minimise or eliminate waste. For example, paper is used on both sides when practical in the office. Printing Toners are recycled. A recycling bin is placed in all units and we encourage guests to use these. Paper, glass, plastics and cans are all recycled. Where possible we select items and materials that are biodegradable or can be recycled. We also have a very healthy compost bin. We are pleased to be able to offer complimentary accommodation at Harringtons Motor Lodge to the Palmerston North Hospice for their visiting staff. Knitting ‘Beanie’ hats for the ‘prem’ babies and ‘peggy squares’ for knee rugs for the elderly are other current projects.